The Skeleton is Richard III! 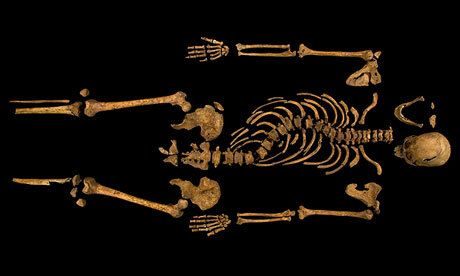 Exciting news today, it’s now been confirmed the skeleton found under a car park in Leicester is that of Richard III, solving a 500 year old mystery! 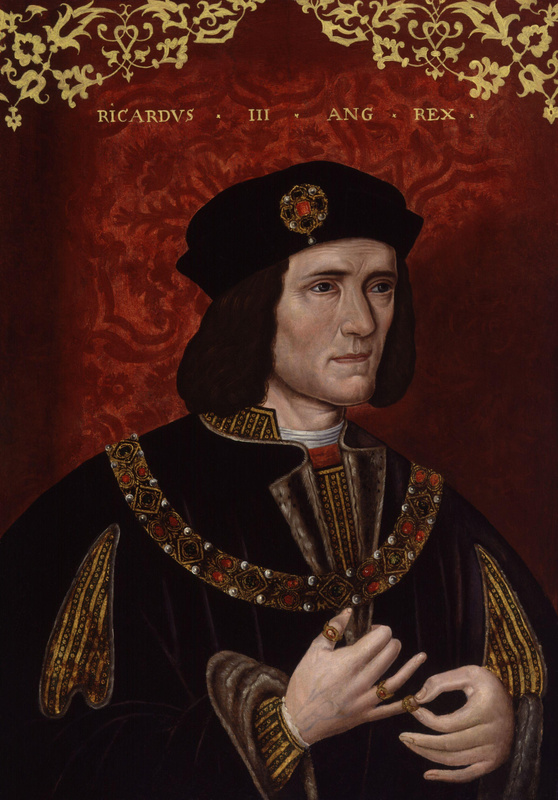 Richard III died in the Battle of Bosworth in 1485, defeated by the first Tudor king, Henry VII, but until now we had no idea where his remains were. 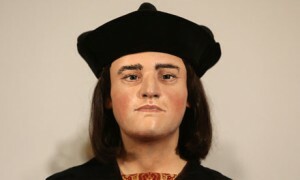 Historical records told us Richard was taken to Leicester and his body put on display as proof of his death. Research then led archaeologists to the site of the former Grey Friars Church which was demolished by Henry VIII before finally ending up as a car park. Archaeologists from the University of Leicester began excavating the site in August last year and soon found the skeleton which was in good condition but missing it’s feet. A report in one paper today said the arms were crossed indicating Richard was bound when he was buried. It’s also been reported there was an arrowhead lodged near the spine. It’s been revealed that Richard III died from two blows to the head one of which sliced off part of his skull, possibly because he lost his helmet. The injuries were inflicted by a bladed weapon, possibly a halberd, which is a pole with an axe and spike on the end. In total 10 separate injuries were found, showing what a brutal death he must have suffered. It really brings home what harsh times these were. Researchers have also confirmed that Richard III did suffer from curvature of the spine and this can clearly be seen from the photographs in the papers. Richard III was 5ft 8in tall but we have no way of knowing how tall he would have stood as a result of his condition. The other myth about Richard’s appearance is that he had a withered arm, but there is no evidence of this from the skeleton. We may now need to take another look at the books written about Richard III in light of all this new evidence. Professor Lyn Foxall said in the Evening Standard today that ”We could end up re-writing a little bit of history in a big way”. There is a documentary on Channel 4 this evening about the excavation which will hopefully reveal a lot more about what’s been discovered and clear up some of the conflicting reports I’ve read in the press. There is certainly no denying how exciting this find is, deputy registrar at the University, Richard Taylor, sums it up perfectly by describing it “as one of the biggest archaeological discoveries of recent times”. Richard’s remains are to be re-buried with full honours at Leicester Cathedral which is a much more fitting resting place for a former monarch. This entry was posted in Richard III, Wars of the Roses and tagged Richard III, Wars of the Roses, Yorkist by admin. Bookmark the permalink.